This Japan job hack is simple and easy to implement. Applying for jobs in Japan can be tough. Thankfully, there are ways to make the job hunting process in Japan a little easier (even if you aren’t in Japan!). 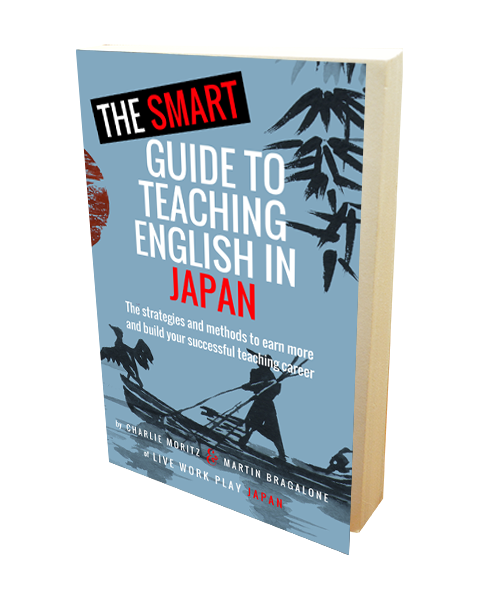 I use it to find translation work as I translate Japanese to English online, but you can use it just the same to find English and other foreign language teaching jobs in Japan, part time jobs in Tokyo and other Japan jobs. If This Then That – An Amazing Hack for Getting Jobs in Japan. I’m not the first person to notice how useful IF THIS THEN THAT is. It is possibly the greatest time saving hack on the internet I know of! Have you ever used Craigslist to do job hunting or maybe even to search for a really cheap couch for your new place? If you have, than you may know that Craigslist is filled to the brim with offers of all sorts. If you live in Japan, Sayonara sales can be great finds especially when you just are moving in to a new place. A Sayonara sale is when expats leave Japan and have to get rid of a lot of stuff as quickly as possible. You can get great deals and even free stuff by taking advantage of these sales. 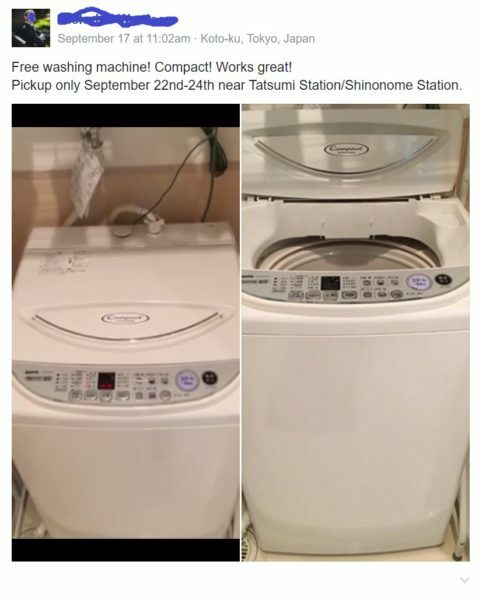 Marco and I (podcast guest for The Grandpa Method) even got a washing machine and refrigerator for FREE from a fellow gaikokujin when we first moved to Tokyo. In Japan, getting rid of large items like a couch or refrigerator actually costs money. These are called 粗大ごみ sodaigomi. Thus, many foreigners just prefer to give it away to other foreigners that are willing to come pick it up. It is a win-win. The sheer selection on Craigslist Tokyo alone is amazing at times. Other times it is very disappointing and yes there are plenty of scams on there too. Having said that, I have seen amazing gems on Craigslist such as legit high paying jobs at good schools right in the heart of Tokyo. Ups and Downs of Craigslist in Japan. The advantage of Craigslist for the employer side is that there is virtually no barrier to entry. It is free to post job offers and you can post as often as you like. The major disadvantage for all parties with Craigslist is, you guessed it, that there is virtually no barrier to entry. Scammers, liars, cheaters and time-wasters can both post fake jobs and apply for them in droves. They clog up the system and generally just waste everyone’s time. I have used Craigslist to post high end translation jobs. I remember when I worked on a two-man translation team with my boss, we wanted to look for another bilingual native English speaker to help us cover the translation work that we had. We worked with top pharmaceutical company IT departments in Tokyo providing translation and interpretation. My first idea was to look on GaijinPot. Immediate sticker shock. Posting a job on GaijinPot for instance can cost anywhere from hundreds to thousands of dollars now. We gave up on that right away and went straight to Craigslist. It is really too bad that the price is so high on GaijinPot now because it means that fewer employers are posting jobs there these days. If GaijinPot sees this post, just gonna put this out there: your ads are too expensive; only big companies can afford to put their ads on there now. How about a value package for small businesses? The third member of our team stood to earn a great salary with company insurance and visa sponsorship while working in Nihonbashi, Tokyo with us. Awesome benefits aside, the experience alone for having worked on a team like ours was quite a find. If we went to Craigslist – largely because we didn’t know where else to turn – than just imagine who else could be on posting jobs on Craigslist right now looking for talent. If you are on Craigslist at the right time, you might just find a diamond in the rough. The question then is how do you sift through all of the rubbish on Craigslist (and we know there is a lot of it) to find the worth-while ads? There is a solution now to make your life a lot easier. Just open your email. Let me explain. I came across IF This Then That a year or so ago and it has made my job searches much easier ever since. IFTTT links websites and web/mobile applications together that natively do not have a system for you to create and customize what you see. IFTTT is completely FREE and allows you to do that. You can link Facebook and Twitter for example so that every time you send out a tweet with a certain hashtag, the tweet is automatically posted to your Facebook page, or sent to your inbox. You can get notifications for anything you can think of. With Craigslist, you are able to set up recipes for notifications to specific searches. If you are looking for teaching jobs, you might want to focus on the [Education] tab on Craigslist Tokyo as well as the [Part-time] and possibly the [Writing/editing] tabs. 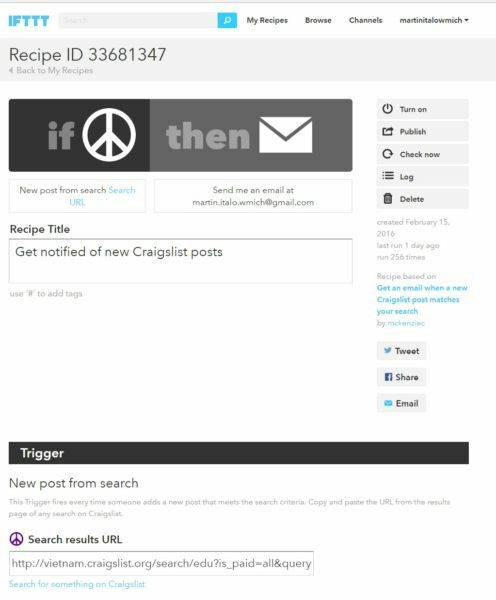 Just copy and paste each URL into a recipe in IFTTT. Once you set this up, you won’t have to go searching for jobs on Craigslist manually ever again! Totally Reversible and Spam Free. Also, if you do find a job and don’t want to receive the IFTTT recipe notification emails anymore, you can unsubscribe painlessly all over the IFTTT website via the [My Recipes] tab. Then, find the recipe you want to turn off and click on it. You can turn it off and back on again anytime you look from the recipe page. 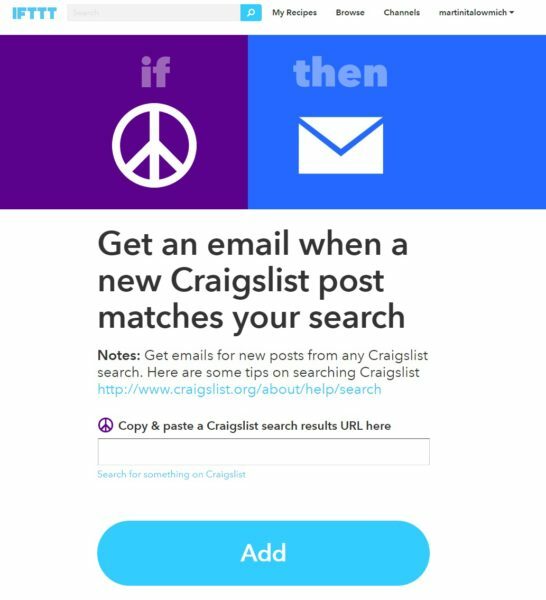 Once you turn on the notification (turn on the recipe), you will receive emails with the text of the main body of the Craigslist ad and a link to the Craiglist post. This is great because you don’t have to click on the link in the email every time just to see what it is about. Not the be-all and end-all. Craigslist should absolutely NOT be your bread and butter for job hunting in any country and especially not for Japan jobs either. We have written several posts covering much more reputable job hunting recruitment firms and sites. 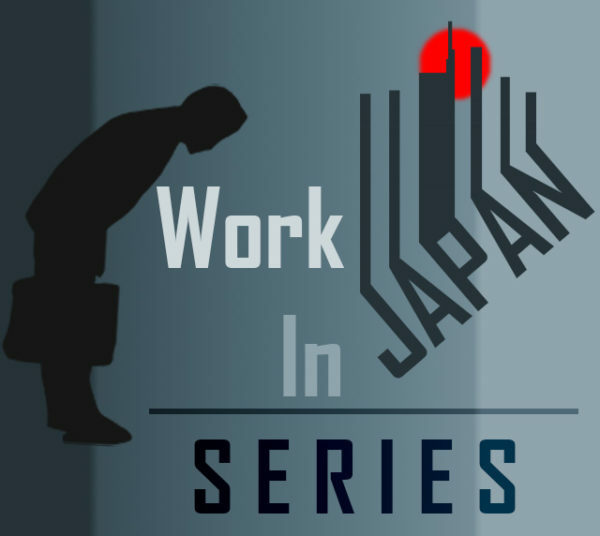 See our post, “Get a Better Job in Japan Series Part 1” for excellent resources and strategies that will help you actually get the jobs you find. You want to attack this thing head on with all you can throw at it. If you are using Gaijinpot, great! Got a recruiter or two working to help you find jobs in Japan? Nice! You can use all of it and more. If This Then That can help you sift threw the junk and get right to what interests you all from your email inbox. Job hunting in Japan is tough enough, why not make it a little bit easier on yourself? Comment below if you’re gonna try this for your job hunt! We believe in living the life we want and doing the kind of work we can be proud of in Japan. If you believe that too, sign up and we'll send you our principles and strategies to help you find success. Check your email NOW to confirm your subscription! Our Book is Available on Amazon Now! 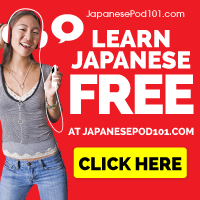 Get JapanesePod101.com premium for just $1 for the first month! We are not a recruiter.